At the Park Station monthly meeting, Capt. John Sanford stood in front of a group of fewer than 10 people and announced that, after three years, he had been reassigned. On Saturday, he will be replaced by Capt. Una Bailey from the Investigations Division for Special Victims. Sanford is headed to the Community Engagement Division, where he will work under Commander David Lazar. He is one of 20 officers reassigned in a move announced Monday by Police Chief Bill Scott. 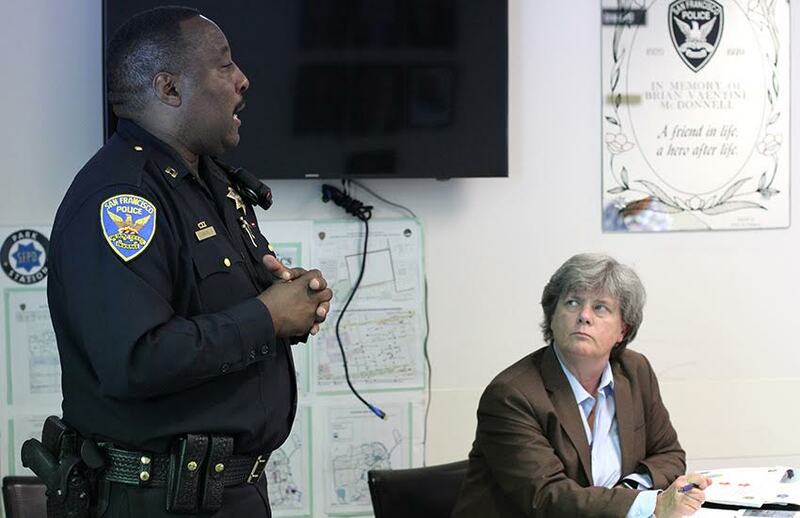 Sanford, who has worked at the SFPD for 33 years and is six months from retirement, began his career as a beat cop walking the Haight-Ashbury and served at five other stations before returning to Park Station. He was close to having his career come full-circle at Park Station. “Hey! That’s the way things go,” he said. Scott has been a big proponent of foot patrols and standardizing the way police interact with community members. Sanford seemed unclear as to management’s overall logic behind the changes. Sanford continued on with his usual monthly slideshow, clicking through the same statistics he presents at every meeting. Bike thefts are up this year. Vehicle thefts, too. Sanford said that tourists visiting the Park Station jurisdiction’s historic sites shouldn’t leave things behind in their cars. At the end of Sanford’s presentation, he was asked about how Park Station would continue without his leadership. Larry Rosenfeld, co-chair of the Community Policing Advisory Board (CPAB), defended the district’s structure, which Sanford had worked to put in place. “At the lieutenant level, we have some very engaged officers … like Lt. Jay Newman,” Rosenfeld said. However, before Rosenfeld could finish praising the work of Newman, Sanford pointed out that Newman was also being reassigned. “I take it all back,” Rosenfeld joked to the reporters in the room. The public meeting ended in an hour. At that point, police rearranged the tables to begin an official meeting with the Community Advisory Board, a group of less than a dozen residents, most of whom stayed from the first meeting. The session included several general conversations about Tasers — which the Police Commission is expected to vote on before the end of the year — and neighborhood gossip. Around 8 p.m., two hours after the meeting began, Sanford began to give his goodbyes to members of the advisory board. He shared a story of Lily Prillinger, a local beat cop in the Haight-Ashbury, who receives lots of praise from the local community. “Not that I know of,” Prillinger responded.